Call, email, or stop by! We are easy to get a hold of and ready to help find your next Guam home. Keep in mind, our services are FREE for the renters and buyers. 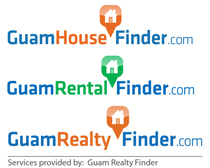 Let us help find a Guam home the easy way, at Guam Realty Finder! Include contact number for faster response. We respond personally within 24 hours, but usually a lot quicker.